Released as one of Camacho’s standard bearer Bold Everyday Smokes, the Connecticut promises a rich and creamy experience. 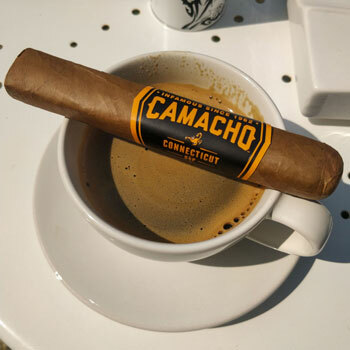 Whilst the Connecticut has been a member of Camacho’s range for a number of years, we were still excited to provide it with a full review. The Camacho Connecticut is a widely available blend that has been released in a plethora of vitolas. Made using Camacho’s celebrated powerband booking method, it offers a balanced draw and laid-back smoking experience. Furthermore, it is now also available in a Box-Pressed (BxP) vitola. Aesthetically, there is a fair difference between these cigars due to the box press method. However, the blends themselves are more-or-less the same blend save for additional American Broafleaf in the box-press. By adding American Broafleaf to the box pressed Connecticuts, Camacho says that this itensifies the aromas and dramatically boosts the overall tasting experience. Bespoke Unit founder Paul Anthony and I were very curious to see how these differed when smoked. At first glance, the only discernable difference between the regular parejo and box-pressed Connecticuts are the shape. Otherwise, both a very similar in their texture and appearance. Both feature a creamy latte coffee hue of wrapper with a very mild sheen. Their wrappers both border on a matte finish with a slight satin touch. As for the rolling consistency, it’s as you would expect from Camacho with a mild spongy spring. In terms of aromas, both cigars feature the characteristic scents of Connecticut shade tobacco. A good inhale along the body brings tangible imagery of dry straw on a sunny day with aromatic notes of summer savory and thyme. Being handmade products, it is said that every cigar is different. For this reason, both Paul Anthony and I smoked a few Connecticuts each. Furthermore, we smoked the Robusto vitola of both the regular parejos and box-pressed cigars. Taking a dry draw on both vitolas, they seemed to be relatively similar. However, the Box Pressed provided slightly more resistance than the regular Parejo that was somewhat looser. Meanwhile, the aromas were quite similar. The flavours were nuttier than expect with a slight Brazil Nut bitterness. Nevertheless, there was an overt coffee cake accord, which brought out a creamy milkiness with the coffee roast flavours. That said, the Parejo Connecticut seemed somewhat more bitter than the Box-Pressed that felt more aromatic in flavour with notes of Grapefruit. Both Connecticut vitolas started off as rather mild and smooth smokes with a few delicate notes of straw and citrus. Neither were particularly overpowering and felt quite linear during the initial ten minutes after lighting. As a bit of ash began to form, both cigars began to form an underlying note, which was different between the two. Whilst the regular Parejo shape leaned towards woody notes reminiscent of birch, the Box-Pressed was somewhat more aromatic. For instance, the Parejo’s birch notes reminded me of birch tar and suede leather. Meanwhile, the Box-Pressed featured a small herbal bouquet of the summer savoury as well as thyme and sage. Camacho Candela Cigar Review - The Green Wrapper Returns! As Paul and I made our way to the second thirds, we noticed that the citrus notes dissipated in both vitolas. Yet, we were left with the initial straw notes as well as their respective birch and herbal notes. Nevertheless, each began developing creamy and coffee notes, which were similar yet discernibly different. Firstly, the regular Parejo give off notes that can be likened to a latte coffee with thick cream and an underlying roasted bitterness. However, with a more complex palate, the Box-Pressed felt more like a cappuccino. I was able to pick up both milk and frothy cream as well as the bitter coffee. Furthermore, there were minor aromas of milk chocolate that added an extra level of depth to the cigar. As we drew well into the final third, both cigar shapes began to shed their woody and aromatic notes. Instead, the coffee notes faded to leave a thick and intense creamy note. Due to their very intense and dense flavour, buttercream felt like the most appropriate identifier. Furthermore, both began to develop an overt smoked yeastiness that can only be described as toasted brioche. This was particularly satisfying and it was interesting to note how two cigars started on different paths only to come back together towards the end. If there was any difference to be noted, the Boxed Press remained quite smooth throughout the smoke whereas the regular Parejo grew some peppery characteristics. Although the notes tasted during the smoke were quite similar and shared a number of characteristics, the burn was somewhat different. Firstly, both cigars featured very even burns as we’re used to with Camacho. However, the Box-Pressed Connecticut featured a slightly stronger ash that was less prone to falling during the smoke. Similarly, the Parejo had a tendency to heat up, which created some notes of pepper. Meanwhile, the Box-Pressed maintained a cool and balanced smoke throughout. As for their draw resistance, both seemed quite similar with a faint but not overly loose draw. Given that the Box-Pressed was a cooler smoke, it also lasted longer as it didn’t burn through getting too hot. Therefore, you can probably enjoy a Box-Pressed around 10 minutes longer than a regular Parejo Connecticut. As can be presumed by reading the previous sections, the Connecticut is a very creamy smoke with hints of coffee. This is a characteristic that’s quite common among Connecticut shade grown cigars and they usually pair wonderfully with a coffee. However, they are best smoked with milder coffee such as a creamy latte or even a mild espresso. For instance, strongly roasted and bitter or coppery espressos would be too strong with a Connecticut. If you can find a milder roast, this would be ideal. Otherwise, Connecticuts pair quite nicely with other refreshing beverages such as beers, ciders and soda or even Champagne! This is because their body isn’t too full, which doesn’t overpower the senses. As with all of Camacho’s offerings, the box is beautifully lacquered with the range’s colours. Here, these are orange and black, which are reversed on the Box-Pressed case. In fact, they’re quite reminiscent of the UPS logo! Furthermore, we have some lovely details including Camacho-branded hinges and an inside panel on the box, which explains the cigar’s characteristics. It was also quite interesting to see these boxes side-by-side as you can see the space gained when the cigars are box pressed. Originally, it is said that cigars were first box pressed to save on space when shipping across the country or the Atlantic. Here, we can actually see the difference for a box of twenty sticks. Otherwise, the cigar bands are identical with the same colours and style. On the inside of the bands, you can spot a watermark featuring Camacho’s scorpion logo. As the Bold Everyday Smoke range suggests, these are wonderfully casual cigars that are ideal for laid-back smokes. Being quite light and not overwhelming in body, they’re comfortable to smoke any time of day. However, we’d say that they’re best suited for the mid-afternoon. Unless you’re new to cigars, these aren’t a cigar to reserve for special occasions. Instead, they’re great to be enjoyed alone with friends. With summer around the corner, these would be a fantastic choice for an afternoon barbecue with the boys for instance. Meanwhile, the Box-Pressed might be an unusual novelty for some and definitely worth trying. For those new to the shape, they may seem somewhat awkward at first but they’re certainly worth testing. Being a cooler smoke with a more complex blend, the Box Pressed is our preferred choice of Camacho Connecticut. Whichever you choose, you won’t be disappointed with Camacho’s selection of Connecticuts with a variety of shapes and sizes available at similar prices. In fact, we’ll be reserving a few of these for our afternoon coffees spent editing content in the garden this summer! Enjoyed the review? Watch the video below! Reviewed by Charles-Philippe, on 9 May 2018 . "An aromatic and creamy experience. Camacho's take on the Connecticut is creamier and more intense than your usual blends." Perhaps when time permits you can do a piece on Pipes…. It’s on the hit list! Both Charles-Philippe and I do smoke the occasional pipe. Maybe this fall we’ll have time to do a detailed guide. I saw that you just reviewed the Nub Connecticut. Which one is better in your opinion? Although they’re both named after their Connecticut wrappers, they’re very different cigar experiences. They share some yeasty brioche notes but the Camacho is more herbaceous with citrus whilst the Nub draws flavours from cream, spice and leather. They’re both great smokes with excellent burns but there are noticeable differences in burn temperature due to the gauges and vitolas. In the end, it comes down to personal preference but I don’t think that there’s an objectively “better” cigar.